Sometimes we come across a product that makes us smile and feel happy. 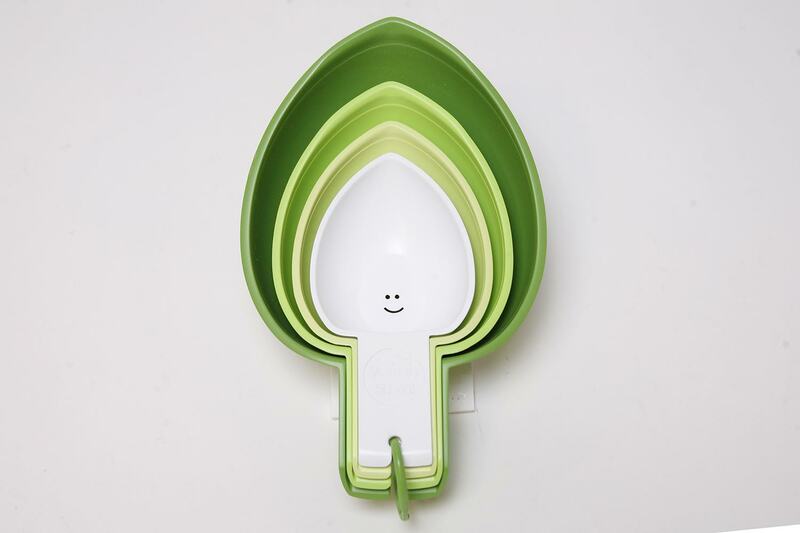 That’s what I thought when I first saw Q.D.Foodie’s adorable kitchen tools. Then I learned the tools were designed for both kids and adults. Note to self: holiday gifts! Q.D. Foodie is what I call a from the heart story. From development of the fun animation about the Q. D. Foodie character to the back-story of how & why founder Marci Heit created this, to the woman who inspired Marci, to the inclusion of braille on the tools to the nonprofit give back this is a very special product! About Marci Heit, Q.D. Foodie I’m a voice-over artist and a content creator for animation. I’m thrilled to be part of the Foodpreneur Interview series. Thank you for having me, Diva Foodies! Diva Foodies: Pleasure is ours! I’m excited to share your story Marci. Marketing support usually begins after a product is conceived. However, I might say, Q.D. Foodie is almost an inside-out idea. 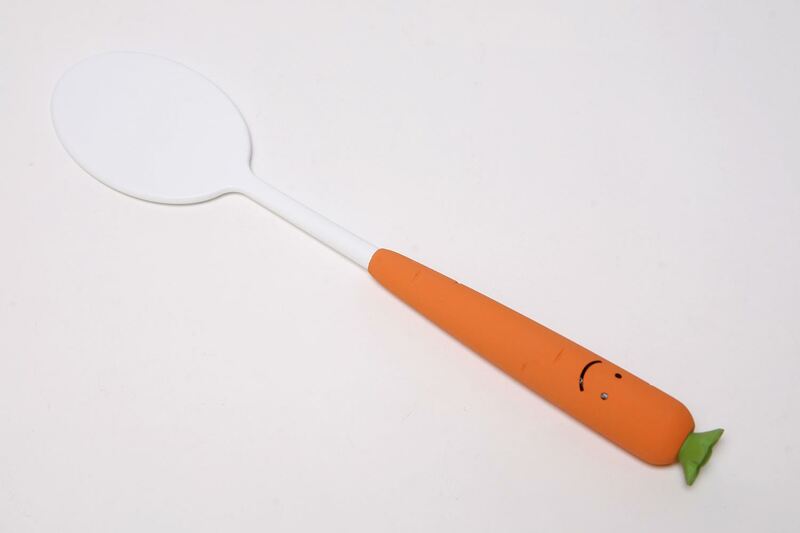 The wrap around concept came first and the product (your adorable kitchen utensils) flowed from the original idea. Please tell our community the back-story of how and why Q.D. Foodie was conceived. Q.D. 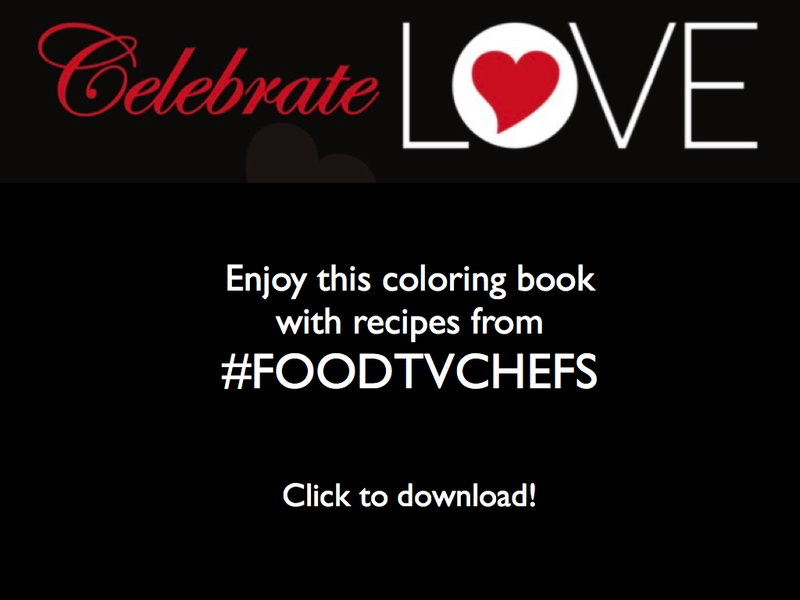 Foodie as a coloring page! Marci Heit, Q.D. Foodie: I had been represented by a rather large talent agency, which mainly focused on celebrity talent. It was great that this agency liked my voiceover work, but I wanted to be working more, so I took matters into my own hands. At the same time, I was a volunteer puppeteer for a program called Kids On The Block (KOTB), a disability awareness puppet show program for elementary school students, and I had a blast voicing the characters. The message of the show, that kids are different but inside they’re the same, was an important one, and the audiences were always extremely receptive. I contacted the creators of KOTB to see if we could collaborate on a TV project with the themes and the characters of the puppet show, and I would do the voiceovers. They were happy to keep the puppet show as it was, and it was terrific that way, so why mess with it, but I still was very eager to create something where I could showcase my voiceover skills and work every day. So I wrote an animated TV show. I had never written a show before, but I was living in Los Angeles, and I knew plenty of people who did. My friend, David J. Steinberg, had been at Disney, and he really guided me. Since then, he’s published a ton of fabulous children’s books, and you should definitely check them out! I partnered with an animation producer, and even though we didn’t sell the series, there was plenty of positive feedback and encouragement to write more. The writing and the pitch process were both great learning experiences. With a better handle now on how to do this, ideas came more easily, and I was able to get them fleshed out more easily, too, and before I knew it, I had quite a few. So I started an animation production company called It’s Real Entertainment, which creates and develops original animated content on the company’s behalf, and for clients, as well. One of the properties I created was called Q.D. 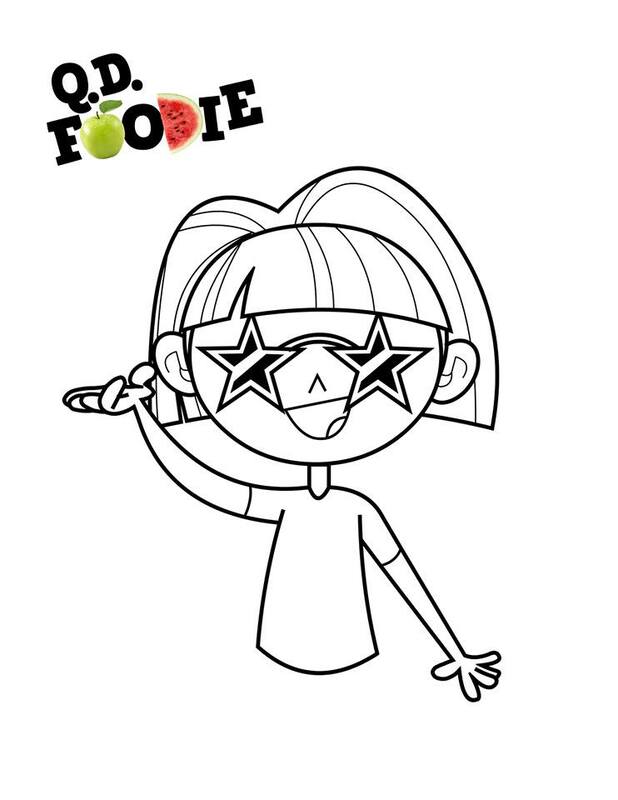 Foodie, about a blind girl who loves to make things with food. After each puppet show, a speaker with a disability would talk to the kids, and one of them was blind. After losing her sight at 70, and now at 90, she still lived life to the fullest, and she loved to bake. This was the inspiration for Quinn Daisy (Q.D.). When we designed the kitchen tools as props for the the show, they were so fun looking and happy, and I just really wanted to have them in my kitchen, and I thought that others would enjoy them, too. 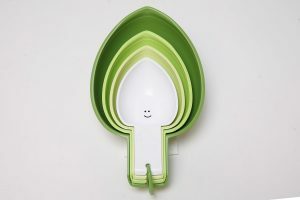 Diva Foodies: I love the playfulness of the designs. However, with children as the primary market, I am curious why the utensils were created in adult size versus a smaller version for kids? 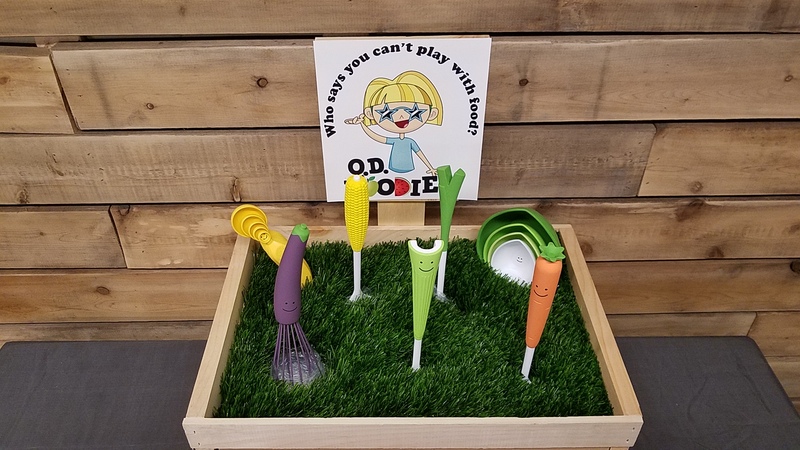 In your product testing, did the kids have to adapt to using adult size kitchen utensils? Marci Heit, Q.D. 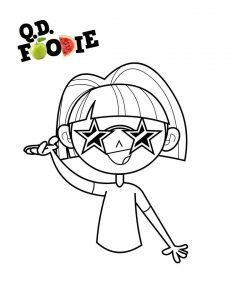 Foodie: One of our objectives with the tools is to get kids excited and engaged in an adult kitchen. 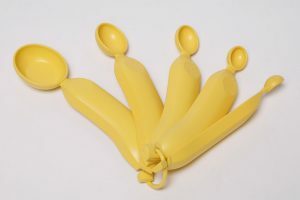 The handles are made of silicone, so the pieces are grip-able and are comfortable for any size hands, kids and adults alike. They adapted quite well. Keep in mind, the pieces are adult size, but within the range of full sized utensils, Q.D. Foodie Kitchen Tools are on the smaller end of that full size range. Diva Foodies: I understand you have a young daughter. Have you cooked together using the Q.D. 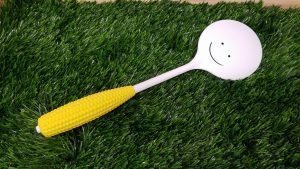 Foodie’s utensils? Which is her favorite and which is Yours!? Marci Heit, Q.D. Foodie: Yes, we have. For our testing, I made different 3-D prototypes to get a good feel of the product and how they would work. Of course we had to be gentle with them and couldn’t use them in real hot situations, but it was amazing to feel how the Q.D. Foodie Kitchen Tools actually brought me and my daughter together in the kitchen. My daughter loves the artichoke measuring cups and banana measuring spoons. She always wants to help me bake, and she’s really into numbers and math now. She’s starting to understand fractions, too, so these pieces, especially, bring lots of happiness elements together for her. She even brought the measuring spoons to school for a show and tell about numbers. As for me, after my real child, these are all my babies. Which utensil do I like best? I seriously love them all to pieces! Diva Foodies: You’re using an innovative 3-D printer to create the initial prototype. For the geeks in our community, tell us about your experience using this technology to create your models. Marci Heit, Q.D. Foodie: It’s amazing that today you can take an idea and create a life like model on a printer. It is so incredibly helpful to actually test your design and function before you make the major investment in tooling the final product. Our last round of prototypes were our proto-reality round which really has helped us get incredible feedback from people to make sure we were ready to start mass production. 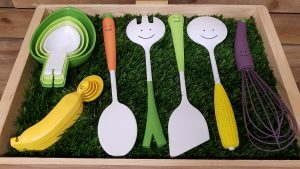 It also helped us make sure that our design really did fit kid and adult hands perfectly, so that kids and grownups can have fun in the kitchen! Diva Foodies: Another interesting part of your (current) story is, as of this post, the product is not launched. You’ve chosen to use Kickstarter as a means to fund your dream. There are so many worthy causes and products that need $$, why support Q.D. Foodie? Marci Heit, Q.D. Foodie: I love getting asked that question, because I love sharing the answers! First, Q.D. Foodie Kitchen Tools make making food more fun. Pretty simple. But when you make making food more fun for kids (and adults) and give them this kind of opportunity to learn about their food, they are better equipped to make healthy choices. Another reason to support Q.D. Foodie is that the collection is inclusive. The measuring cups and spoons have braille on them, since Q.D. herself is blind. Her friends and family, however, are not. Everyone can join in, and that works whether it has to do with vision or someone’s just having different ideas about how things should go. Last, Q.D. Foodie gives back. A portion of all proceeds will be donated to the Houston Food Bank and to Leket Israel National Food Bank. As we grow, we will be looking for additional ways to help. Please send us your suggestions. Thanks for asking! 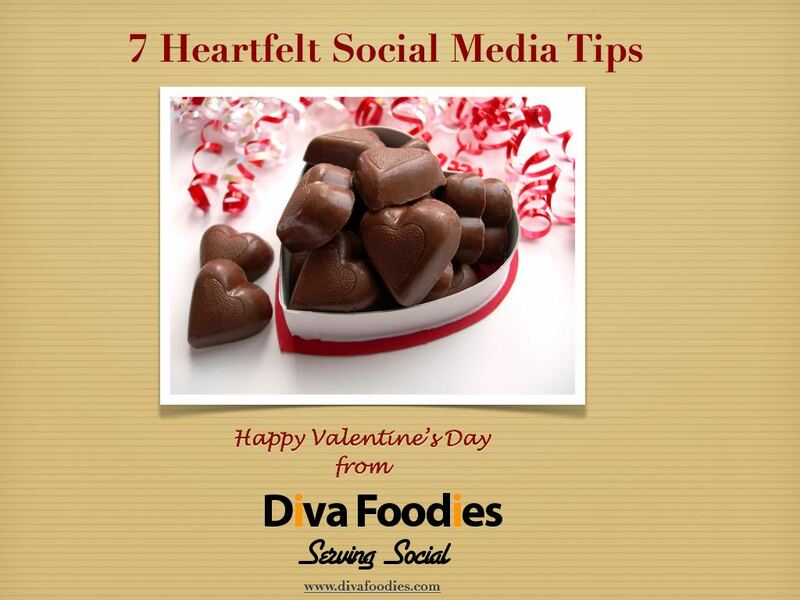 Diva Foodies: Of course! Although you’re still in the start-up phase, what one tip would you give to a person who wants to enter the world of foodpreneurship? Why is this tip important to you? Marci Heit, Q.D. Foodie: Have your product or service truly reflect your story and who you are. Your own story will naturally bring with it a passion that will keep you going, and those together will engage your audience. Love what you are doing. It’s a long haul. It’s true! I love what I do, and my wish for my daughter and for the Diva Foodies family is that whatever path is chosen, it’s chosen from the heart. Diva Foodies: As is Diva Foodies, tradition – you get to wrap it any way you’d like! Marci Heit, Q.D. Foodie: Q.D. Foodie Kitchen Tools will be available first through our April 2018 Kickstarter campaign for a special introductory price. You can always find us on our website and in social media (links below!). We’d love to hear from you! Please share your thoughts on the product with us and photos of you with your Q.D. Foodie set! As Marci demonstrates Q.D. 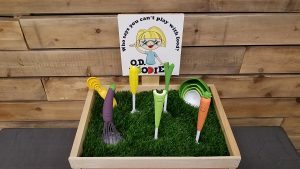 Foodie’s kitchen tools make great musical instruments too!